Veterans often suffer brain injuries that impair hearing. As part of Deaf Awareness Week, Caroline Brogan spoke to an expert on the subject. In the UK, 300,000 veterans live with hearing loss. Ex-service personnel under the age of 75 are three and a half times more likely than the general population to report difficulty hearing. However, according to The Royal British Legion (TRBL), who fund Imperial College London's Centre for Blast Injury Studies (CBIS), relatively little attention is given to ex-service men and women living with hearing loss. The main hearing issue in veterans is auditory processing disorder (APD), which originates in the brain instead of the ear. In APD, a blast from an explosion can disrupt the brain's processing of sound, leading to debilitating conditions such as deafness and tinnitus. Dr. Tobias Reichenbach from Imperial's Department of Bioengineering and CBIS is a leading expert on APD. CBIS is the only place in the UK where military medical officers, civilian engineers, and scientists collaborate to address the issues surrounding blast injury. To highlight Deaf Awareness Week (14-20 May 2018), Dr. Reichenbach spoke to Caroline Brogan about his work on APD. APD is a disorder of the brain rather than the ear. Those affected can find it hard to differentiate between sounds: They might have trouble understanding a speaker in a noisy environment, such as in a loud restaurant, or on a busy street. Patients can be born with APD, or they can develop it through brain injuries caused by blasts—this is why it's a major problem for ex-service men and women. What are the main challenges in APD research? We are working to build a good understand of the brain injury that causes APD. Until we do this, studying and correctly diagnosing APD will remain tricky. A major challenge is to find ways of helping patients to better understand speech in noisy environments. How are you working to address these challenges? We look at how the brain processes speech to pinpoint which mechanisms and brain areas cause problems in APD. From this, we explore how brain stimulation combined with audio might help patients better understand a speaker among background noise. 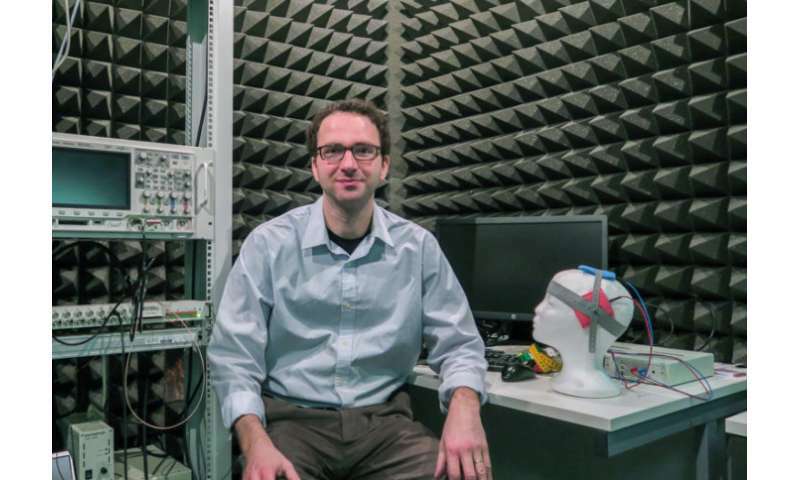 We are even developing mind-controlled hearing aids for patients. The smart component uses recordings of brain activity to identify which of several speakers a user wants to listen to. After honing in on the desired speaker, the hearing aid enhances that particular voice to make it easier to understand. What have you found thus far? We have shown that understanding speech in noise begins in the auditory brainstem, a relatively low-level part of the brain. From this, we've developed a way to stimulate the brain to help patients better pinpoint speech among noise. This is how the mind-controlled hearing aid works. Which collaborations have come through your work? As a bioengineer, I lend my engineering expertise to treating APD, however endeavours like this often require expertise from several different fields. Working with clinical expert Professor Doris-Eva Bamiou from UCL, for example, helps our research to benefit from the multidisciplinary approach. We are currently studying how patients with APD process speech rhythms. Speech rhythms influence how speech is processed in the brain—we want to know how this is impaired in patients with APD. How has TRBL enabled/helped you to carry out your work? TRBL has offered fantastic help for our work by funding and supporting CBIS at Imperial. As well as the funding, they also help me recruit veterans with hearing impairments to investigate their neural disorder. Having this access to those who are directly affected by APD really helps to guide my work and hopefully improve their lives.